Triple-R: Complete Custom Wheel with Hoosier Tires - Track Wheels! "A windfall" is all I can say. I was lucky enough to happen upon a used set of track wheels and tires. They were from a well known car and one I was quite familiar with. So there was no question of their condition or the reliability of the seller. I wanted them! Could I afford them? No, not really, but at the sellers asking price how could I refuse. These are items I have lusted after since I first started tracking the car in 1998. So what are they? 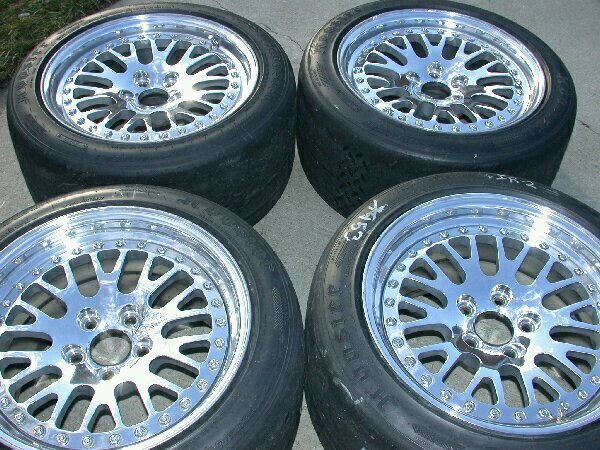 They are three piece forged aluminum wheels manufactured by John Purner atComplete Custom Wheel (CCW), shod with Hoosier R3S03 road race tires. They are the hubcentric track version with no center caps. 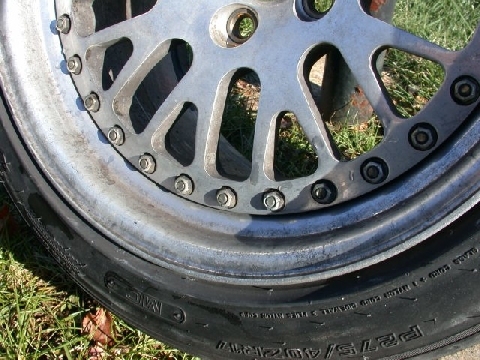 Apparently the street verison uses the center caps for centering the hub and has the mountng bolts around the rim halves reversed, i.e., the bolt heads are on the outside. It's prettier that way, not that it matters to me. The wheels are W-I-D-E! 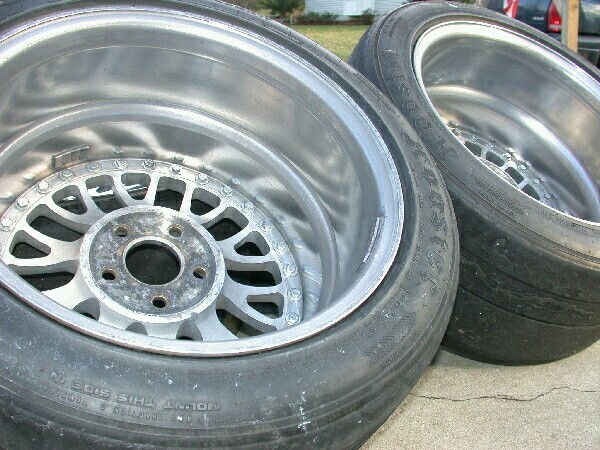 The front rims are 17"x10 1/2" and the rears are 17"x11" both with 275/40ZR17 tires. I'm unclear of the offset but because they came off a 3rd gen RX-7 they should fit my car....I hope. The conditions were though that a coilover suspension be fitted (got that) and rear tubular trailing arms be fitted (got those). So far so good. Well almost, the suspension toe links and trailing arms, that I picked up second hand - brand new, are still on my workbench. So now a real need is here to actually install them. I had seen these actual wheels before and the tires were reported as used but with tread, so no biggie. I expected a used set of wheels and tires and that's what I got. 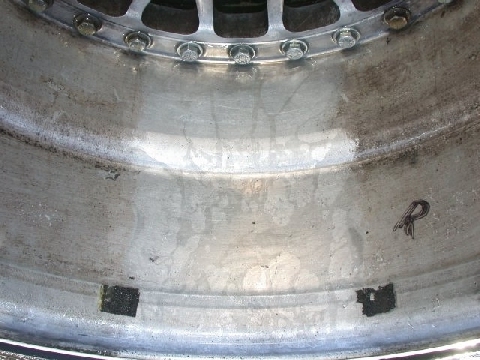 But they hadn't been really cleaned in, I'd guess, the 6+ years of track use they'd seen other than a spritz with a bit of soap and water every year or so. They were pretty grungy in other words. So I set to work! What They Need is a Good Scrubbing! In the beginning. Even after a thorough washing they still looked dirty. Brake dust is nasty stuff. Especially dust from racing compound pads. 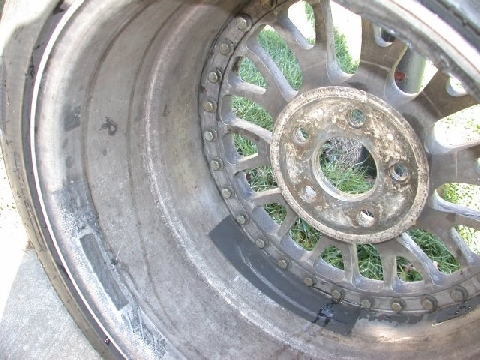 Brake dust is hot, abrasive and corrosive....especially when wet. 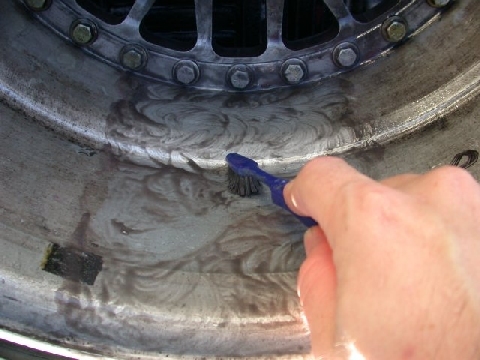 From my own experience I found when the pad dust got wet it would form a paste that would then harden when exposed to brake heat and literally bake itself onto the wheel. And the longer it stayed on the wheels the harder it was to get off. With my current SSRs I would clean then the next day after a track weekend and after 3 years of heavy track use they still look pretty good. 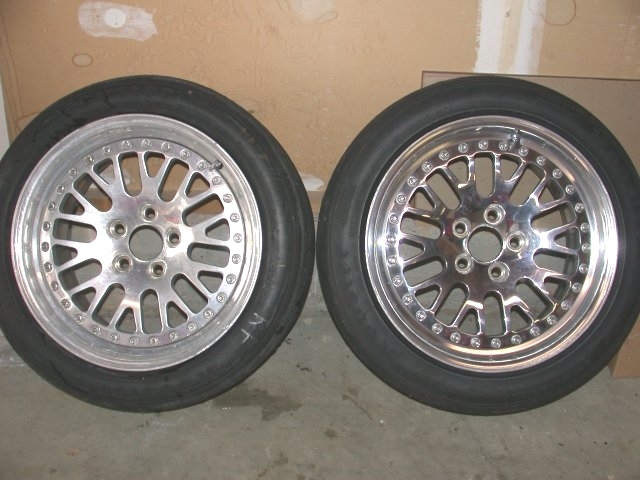 These CCWs, however, were in pretty sad shape, but perfect for a track wheels. But a little cleaning wouldn't hurt. In my opinion it's best to start with the mildest cleaner and work up the strongest. Up to a point of course you don't want to permenantly damage the wheel. So I started with just a hosedown with water to blast off the loose grit. Start washing with a sponge and all the grit will be just like sandpaper on the finish, so rinse it first. This is when the fun began. I had a go with regular car wash. It did NOTHING. So I moved up to concentrated Simple Green (works great for brake dust from my street pads). It did nothing...ABSOLUTELY NOTHING. This is going to be tougher than I thought. Next up, Castrol "Purple" Super Clean, what I use on my SSRs to get the race pad brake dust off *after coating with Pam prior taking the car to the track. Works like a charm. Not on the CCWs however. The Purple stuff is fairly acidic BTW so don't expose your bare hands to it for long and it will dull the finish on exposed aluminum. Now what? I had one last ditch item in my arsenal of cleaners, Navel Jelly. It is promoted as a rust remover, and that it is. But what it really is is a "deoxidant" and, a strong one at that. I used this stuff on an other set (long story) of chrome rims (eeewww!) that I never used (too heavy) to clean them up before selling. 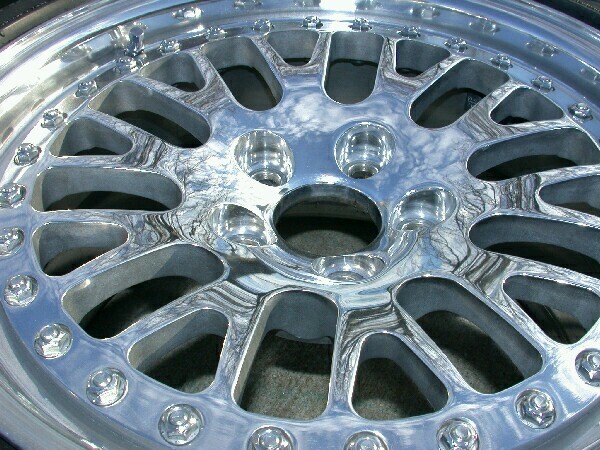 Worked well on the chrome but how about on this aluminum? So I gave it a try and it worked like a dream...sorta. It takes time to work so it has to be brushed on and let sit for a few minutes and then I had to use a toothbrush to scrub the dirt off. Yes, a toothbrush! It works well in all the nooks and crannies (like in between the spokes) but it takes a LONG time. The jokes about the miltary private scubbing bathroom floors with a toothbrush as a punishment come to mind. I bet I spent at least 2 hours per rim. Scubbing with the Navel Jelly. 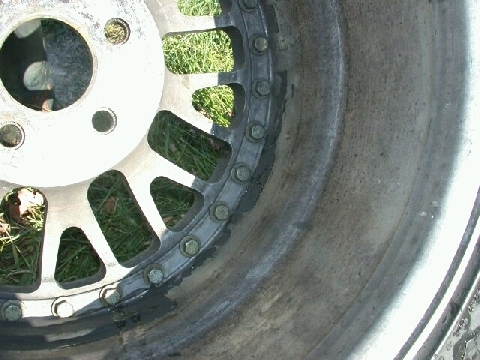 And some of the left over wheel weight tape visible. Two other things to consider, 1) Navel Jelly should not be used on any painted surface and 2) it will etch the aluminum requiring some kind of polishing. But it removed every last vesitage of caked on brake dust. The only other thing left to do to "clean" the wheels was to remove the tons of wheel weight glue/tape left over from previous wheel balencing. No problem. A bit of "Goo-Gone" or straight acetone will remove any leftover mess. Again don't use it on a painted or coated surface though unless you plan on doing some polishing! So there they were 4 clean wheels ready for polishing. Not much to say about polishing. I use Mothers. Best stuff I've ever tried. Nothing works as well in my opinion. I use terry cloth towels only and work about 4" to 6" square at a time, or about 3-4 spokes. Wear rubber gloves or else your hands will be black for a week. Polishing time per wheel 2-3 hours. The polishing went well and the acid burns from the Navel Jelly came out easily but some other defects became much more apparent. 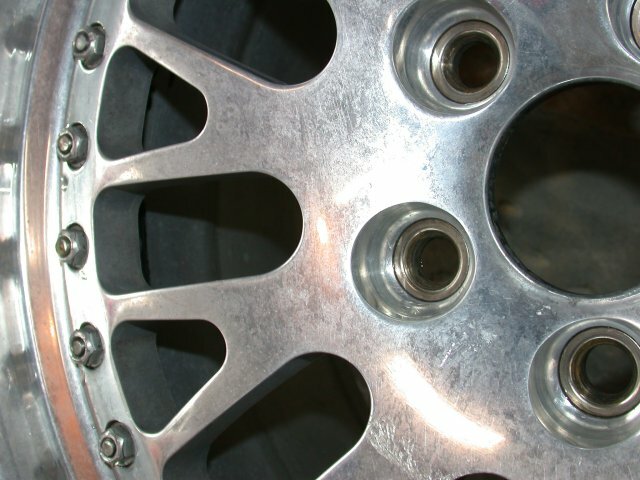 You can see the clean but unpolished wheel looks pretty good but when compared to the polished rim it looks dirty. Note the acid etching on the aluminum in the left hand image. Way back in time, my thoughts are the wheels were stored on a little trailer, perhaps with a chain or something because in a circular pattern around the wheel center was some significant gouges, scratches, cuts, .....what ever. 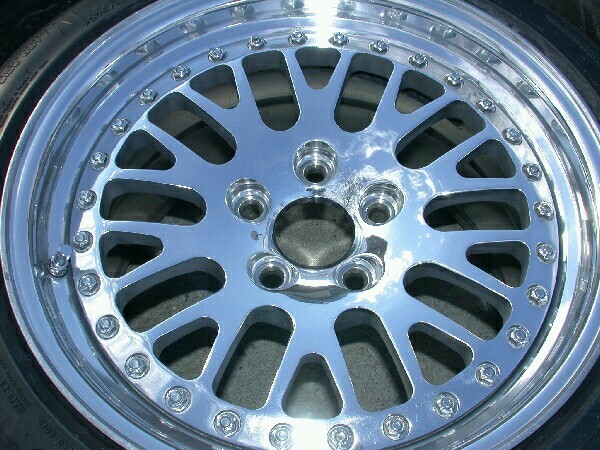 These were on at least 4 of the spokes on each rim. They were ugly and had to go. 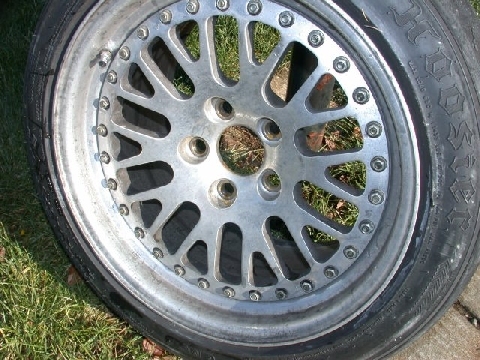 Whats the point of polishing things up nice if there are these marks on the front of each rim? So I broke out the dremel and some sandpaper and set to work to clean up the problem areas. I used some pretty rough emery paper (probably 100grit) to smooth out the surface and get rid of the blemish (done dry), followed by 400grit (done wet), then 800grit (wet), then 2500grit (wet). You can hardly feel the 2500 but it does a great job of prepping the surface for polishing. 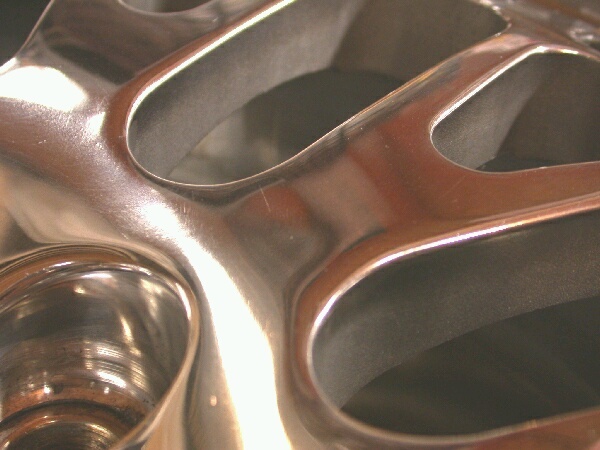 For more on my polishing technique see here. After the 2500 grit a hand polish with the Mothers and the blemish is essentially gone. 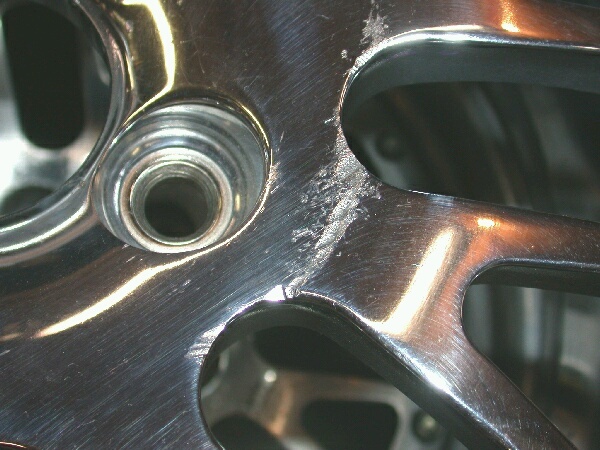 A hefty gouge in one of the spokes: Before and after images. This was one of five gouges on this particular rim. For the gouges that were deep, perhpas 1/8" or more I used a Dremel to smooth out the cut before going over it with the emory paper. I'd guess that removing the scarring from each spoke to take about 30-45 minutes. 4 per wheel which ended up at about 2-3 hours per rim. Time adds up, eh? Well after all is said and done, roughly 35 hours of work, I'm very pleased with the results. I ended up with a set of rims that look brand spankin' new and a set of tires with a least a half a season left in them for about 1/3 the cost - a savings of almost $2000! Now to go take them out on the track and mess 'em all up again! Yes, I even did the insides of the wheels.